Georg Huber is taking you to the wide open spaces of the US, that inspired him to create more than 90 illustrations and sketches in this book. Fascinated by the endless landscapes and abandoned gas stations, he relates the aesthetics and expedience of the sturdy American cars and truck in a harmonious and idealized way and blends them into soothingly staged landscapes. Each of these treasures takes effect from his vital history, told by the rust on colorful varnished metal, the dents, scratches and dusty, rotten seats inside, that almost recap the life of the former owner. With charming stories and information about his itinerary (in German language), Georg Huber comments his artworks and gives an entertaining and informative insight into his many US trips as well as into his creative work. 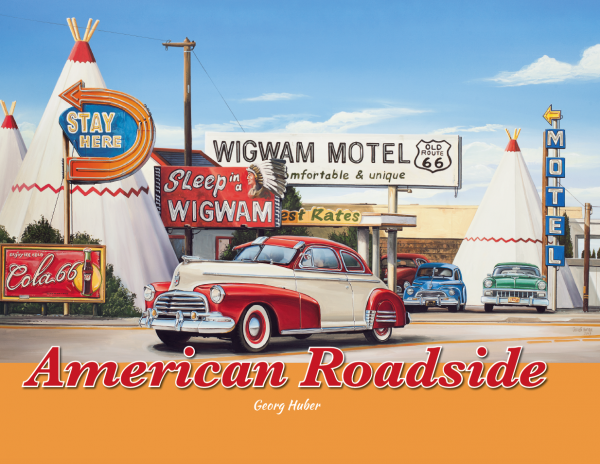 Related links to "American Roadside"
Customer evaluation for "American Roadside"